Habitat: This fish is normally found in pairs in the open ocean around logs, floating debris, weeds, buoys and in warm current. 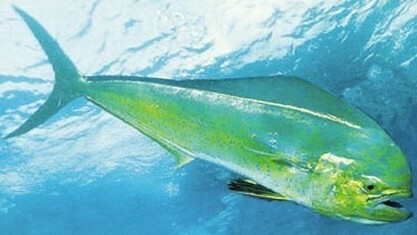 Bait: The Dorado's diet consists small juvenile triggerfish, baitfish , shrimps and crabs. Fishing Strategy: Feeding takes place just below the surface making it an awesome fish to catch, especially on fly. Once hooked the fish will use a combination of surface runs with acrobatic jumps and direction changes. Eating Quality: Good tasting fish.